In this post, we will use Huddl to read, verify and plot the attitude measurements collected together with acoustic data in a Kongsberg EM Series format file. This format, with extension .all, has a long release history; the most recent format specifications are reported here. Data collected at UNH during Summer Hydro Course 2012. This specific example is based on data collected by a Kongsberg MBES EM 2040, during the 2012 Summer Hydro Course, at the Center for Coastal and Ocean Mapping, University of New Hampshire (USA). 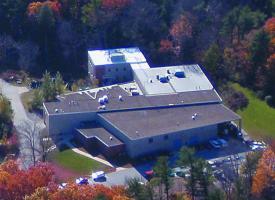 Aerial view of the Center for Coastal and Ocean Mapping, UNH. A Huddl Format Description (HFD) is an XML file that strictly follows the Huddl Core Schemas (HCS). Each HFD file describes the physical and logical implementation of a data format, but can also be used to create documentation explaining the semantic meaning to a human through the use of a suitable XSLT (Extensible Stylesheet Language Transformations) translator, which are widely available. A top-level container, called a Schema, may hold several different descriptions of data formats, each of which has both a Prolog and a Content element. This information is required to create a homogeneous and consistent documentation for different data formats, although the extent to which it is implemented can vary between formats – the better the information, the more complete, and useful, the documentation. The Content branch is used to describe both the structure and the format of a binary data file in a platform-independent way. The wrapper file is then compiled as a .pyd file (that is similar to a Windows DLL). The Huddl-based Python module can be used to access all the datagrams present in a Kongsberg file. We will now focus on the attitude datagram that provides measures of roll, pitch, heave and heading collected asynchronously to the acoustic data. The script uses several commonly used modules, such as Matplotlib for plotting utilities and Pandas for time series manipulation.
""" container for Kongsberg attitude data """
""" convert Kongsberg date """
""" convert Kongsberg time """
""" convert Kongsberg date and time to Python datetime """
time_string = fix_date(date) + " "+ fix_time(time) + "Z"
""" read and store a Kongsberg attitude datagram """
""" provide some info about read Kongsberg attitude data """
""" plot and save the read Kongsberg attitude data """